If you've read this site for any length of time, you've seen my list of Northeast Ohio field turf stadiums....but what would a turf field look like in Orrville? Here's a humble submission. Again, it's just as doubtful as the Smitty Fieldhouse that I posted here a while ago, but, as before, we can dream can't we? Again, this is all in fun, and just for discussion. That being said...how about we throw a few extra mils on the levy and get this done? LOL. 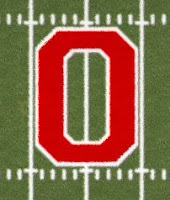 I kept it simple with the midfield "O." You could use the Rider horse logo, or this one, which I think is a sharp look. Nice right? Now what about those endzones? Here's what black and white endzones would look like. I wouldn't use separate colors for each endzone (should be obvious), just illustrating both options in 1 picture. I actually don't mind either. I like the red better though. I'd imagine any color in the endzone would increase the total cost of the project, so maybe just leave it green with red lettering. The up-front cost is prohibitive to most public schools, and with good reason. Basic turf setups start at around $500,000, and that's for a barebones package. Here's a timelapse video of a complete, start-to-finish install. Back to the cost....that's a hefty price tag that typically falls on the shoulders of private fundraising, and after undertaking a $1 million+ fundraising effort on the multi-purpose facility, and an all-weather track that is near or at the end of it's lifecycle, field turf is unfortunately far down the list. What's interesting is that most of the local schools that have turf are either private schools (CCC, Hoban, St. V), or have some sort of cooperative arrangement (Canton Fawcett & the NFL, and Ashland High with Ashland U.) that helps defray the cost. Orrville is neither a private school nor do they have a cooperative agreement (other than Smuckers, I guess), so it becomes very tough to raise the kind of funds needed. Not saying it's impossible or even unlikely, just tougher. But an increasing number of public schools are undertaking fundraising efforts for turf and other stadium improvements, but they seem to be concentrated moreso in affluent communities (Copley, Green, Revere as of late) or communities that have several high schools sharing the facility (Mentor, Parma, etc.). Those schools are also in larger communities than Orrville, and therefore serve more students. Is it even viable in Orrville. A town of 8000 school with maybe 500 students in the high school. Is it too tough to even try to justify. Saved time & money in field maintenance/painting, no more watering, no more muddy fields after a season of freshmand, JV, varsity and middle school games. There's also the potential of hosting playoff games...another potential revenue producer. You could also hold Boys & Girls Club games there too. What a thrill that would be for the little kids. Practice could also be held on the main field now, as well as band practices, soccer games and anything else you can think of. All of that could be done without worry that damage is being done to the field, as is the current case with natural grass. Back to the Orrville example. Now of course, the field is missing the obligatory yellow soccer lines. 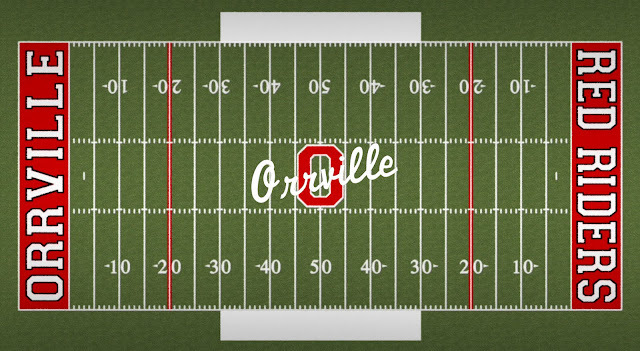 I'd imgine that any field turf at Orrville would include the soccer lines to justify the multi-use aspect of the facility. 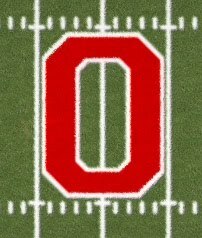 Also, I avoided placing an OCC logo on the field. Never know when another conference change would take place. So what do you think? Question to ponder.....is this a need or a want? With a centralized campus close to reality, is this something that could be sold to the community like the multi-purpose building.....a facility to serve all students in the district and the community. To me, this is the final piece of the puzzle. Centralized campus (basically 3 new school buildings), multi-purpose facility, new baseball field, renovated softball park and a field turf stadium with bleachers less than 5 years old. Orrville immediately becomes the nicest collection of facilities in the county, and I'd put it up against anyone in the Northeast Ohio area. Original image courtesy of Mike over at MGHelmets.com. This would be a wonderful accomplishment for a wonderful sports program at Orrville. 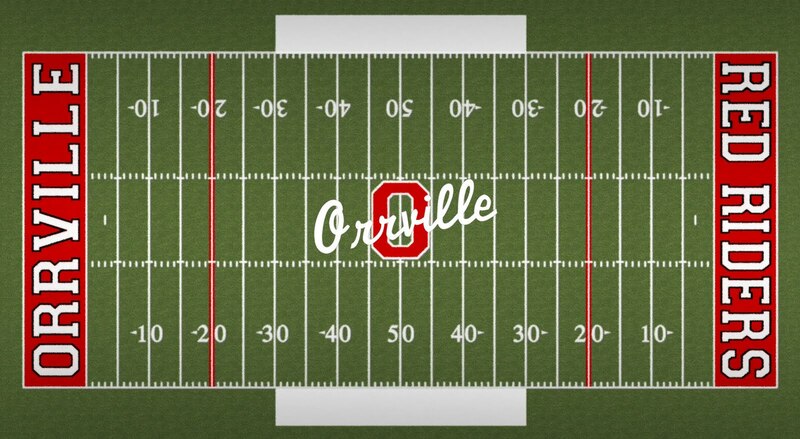 The one thing that comes to mind for me is Orrville's ability, then, to host playoff football games. The Wayne County area is already short on playoff-capable fields, and Orrville would for sure get some business there, in my opinion. 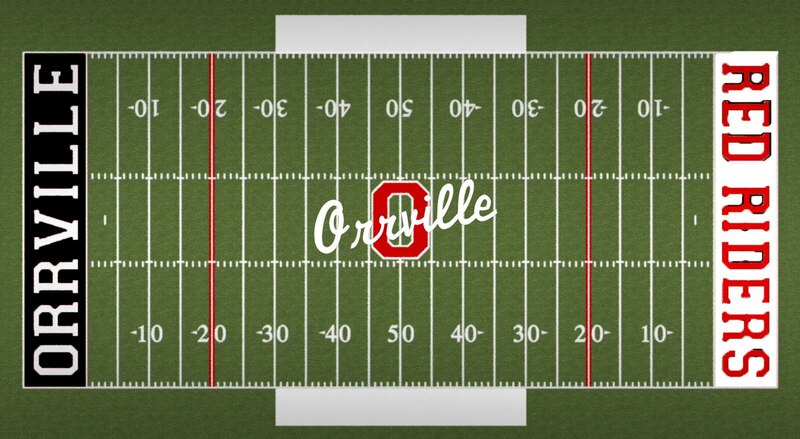 I may be a little old school but being an ex-Orrville football player, my favorites memories were the muddy games played in the rain and having a turf field would take that away. I can see that line of thinking. It's definately something that would be missed. I think the risk of injury is a higher in the mud...mud can grab more than turf....of course, there's a risk for injury any way you slice it. Some of our most recent mud bowls with Wooster were certainly memorable, but I think it cheats the kids and the fans. Neither team can play at a high level in the mud.